Submit YOUR comments to USTR today! The U.S. Trade Representative is currently accepting public comments on how it should renegotiate the North American Free Trade Agreement (NAFTA). Let’s get on the record. TAKE ACTION: Submit your comments today! For almost a quarter century, NAFTA has been enriching corporate elites at the expense of working people and the environment in the United States, Mexico and Canada. NAFTA’s upcoming renegotiation should be used to stop the pact’s ongoing damage and to create a replacement that puts people over profits. If corporate lobbyists get their way, not only will these and other urgent needs be ignored, but food safety measures could be further weakened; access to generic medicine could be further restricted; banks and insurance companies could be further deregulated; and climate change policies could become even harder to enact. It’s time for each of us to speak out. The public comment period closes on Monday, June 12th. 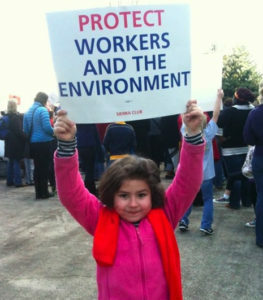 Please submit comments now insisting that NAFTA’s renegotiation prioritize good-paying jobs, public health and a sustainable environment ahead of corporate interests.